A lot of chocolate this week. After the salted chocolate, the next phase was marrying the dark chocolate to my favorite bacon. 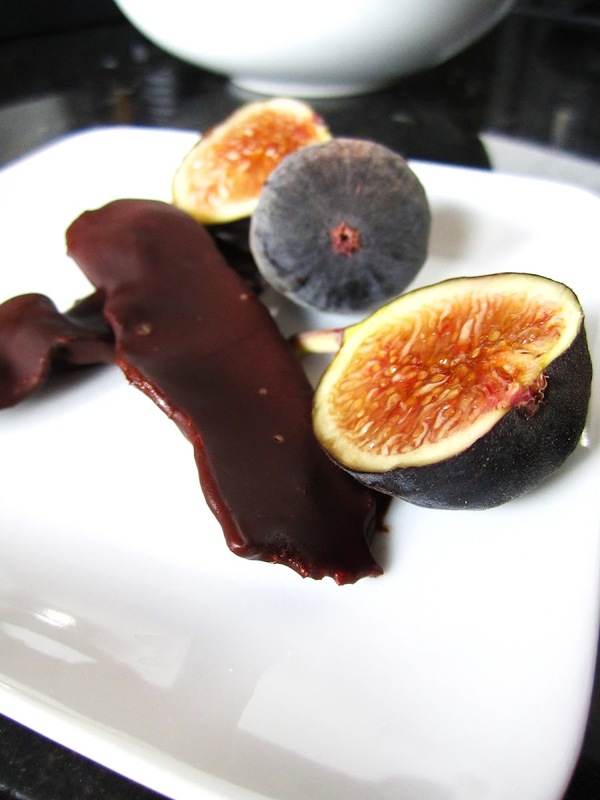 Here it's a quick snack served with ripe black Mission figs. The idea for it started as a garnish for a dessert (coming up) but after I made them, they were so good I ended up just eating them as is. And I wish I could say there is some incredibly complex preparation for this but in fact it was so simple! Microwave the bacon in paper towels until all the fat has come out and the bacon is pretty crisp all through, then cool in fridge. Meanwhile, melt good dark chocolate (preferably in a double boiler, but if not, melt it in a bowl in the microwave in 20 second shots until just starting to melt, then stir until complete). Carefully break the bacon strips in half. Use chopsticks or a fork to dip the strips into the chocolate, place on some parchment, and cool in fridge. This is do great and so easy! Gonna try it next week. Thank you!! This was probably my favorite dessert, with challah french toast. thanks.